Update October 10th: Fracking bans are on the November ballots in Mendocino, San Benito and Santa Barbara Counties. Butte County voters could see a measure on the 2016 ballot. Original Post, July 14th: Opponents of hydraulic fracturing -- or fracking -- have pushed for a statewide moratorium on the controversial oil production technique. With those efforts stalled in the state legislature, activists are taking the fight to the county level. Copying tactics that have worked in Colorado and New York, activists have qualified November ballot measures that would ban fracking in two counties and possibly others, trying a piecemeal approach to banning fracking in the state. Video reported by Gabriela Quirós and Lauren Sommer, who narrates. Oil companies use fracking to squeeze more oil out of rocks. Water mixed with sand and chemicals is injected underground at high pressure to create tiny fractures. The sand props open the cracks, so oil can flow out. California legislators have debated a moratorium on fracking for the past four years, but the bills have repeatedly failed. “We collected enough signatures to qualify in 14 days which was maybe a state record,” says Andy Hsia-Coron of San Benito Rising, the group that’s rallying support for a fracking ban on San Benito County’s November ballot. The ballot measure is largely pre-emptive. While San Benito County has a handful of oil wells in production, oil companies haven’t reported using fracking there. Hisa-Coron says his group is collaborating with activists across the country. Cities in Colorado and New York have banned fracking over concerns about groundwater contamination and land impacts. “We see a battle for sure, but we also see a great opportunity,” says Rebecca Claassen of the Santa Barbara County Water Guardians, a volunteer group that’s put a measure on the local ballot to ban fracking on unincorporated land in the county. Claassen says the legacy of Santa Barbara’s 1969 oil spill came up often as her group gathered 20,000 signatures for measure. Claasen’s group is facing an uphill battle, because Santa Barbara’s oil industry is much larger than San Benito’s. When the measure came up at county supervisors meeting, industry workers turned out in force with concerns about their jobs. 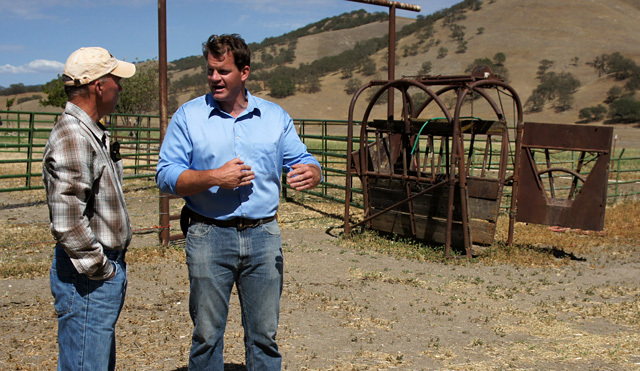 On a recent morning, Nahabedian is meeting with rancher Skip Ramsey about putting an oil well on his land outside of San Ardo, an hour south of Salinas. The drought has hit Ramsey’s ranch hard, drying up feed for his cattle months sooner than expected. He says royalty payments from an oil well would go a long way for his family and his ranch. “To just support college educations," he says, "and I’d like to increase my water capability to raise more feed for my cattle." Nahabedian says if the San Benito measure passes, it could stand in the way of deals like this one. “It’s difficult to make the same sort of offers to landowners in this area with this sort of uncertainty hanging the balance,” he says. Nahabedian’s company doesn’t use fracking, but it does use another oil extraction technique that the initiatives would ban, called cyclic steam injection. Oil in California is heavy, so producers inject steam underground to loosen it up. About 60 percent of oil produced in California is extracted with steam injection and similar methods, making it more common than fracking. Nahabedian says banning steam injection would mean the state’s refineries would have to look at importing oil from outside the state. “It would hurt oil production in our state, particularly in regions that are more economically depressed like the Central Valley,” says Sabrina Lockheart of Californians for Energy Independence, an advocacy group that’s funded in part by the oil industry and is fighting the local fracking bans. California regulators are currently drafting new regulations for fracking, ones that the oil industry says are more than enough to ensure fracking is done safely. Activists like Andy Hsia-Coron don’t believe those regulations go far enough. “We figure that if we pass these initiatives in November," he says, "that dozens of counties will be filing their initiatives and it can even be done a city level." 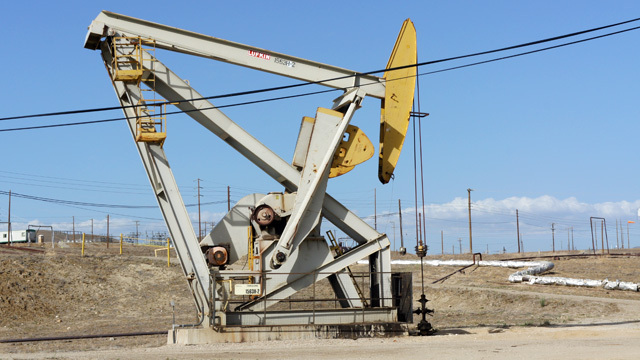 In May, Santa Cruz County supervisors voted to pass a fracking ban. Voters in San Benito and Santa Barbara counties will vote on bans in November. Activists in Butte and Mendocino counties are still working to qualify ballot measures.